Renowned innovator Ray Kurzweil has a list of accolades too long to write about in an article with “Simplified” in the title. I had first stumbled upon one of his YouTube interviews and after listening immediate purchased The Singularity is Near. It’s a comprehensive text filled with fascinating information, but the biggest take away by many was Ray’s analysis of history to track the growth of technology. He observed what he named the Law of Accelerating Returns – a pattern demonstrating that technology advancements were growing exponentially in relation to their size and cost. This discovery has profound implications, and progressive thinkers who are working towards systemic transformation should be aware of it. Depending on how you define technology, the Law of Accelerating Returns has been occurring since the first cell on Earth manifested or as recently as the last century. Data demonstrates that within frames of time the processing power of our computer chips double, while the size of the chip and the cost divided in half. This exponential growth has been observable in all modern computing. Even more eye-opening, the rate at which the doubling is occurring is accelerating as well. Technology is changing, and it’s changing fast. The change of pace is happening so fast that we need to begin to redefine how to think about technological advancement fundamentally. In the image above we see one of Kurzweil’s predictions made in 2001 and one he still stands by today – in 2029, we will have the processing capabilities to develop machines with human-level thinking abilities. 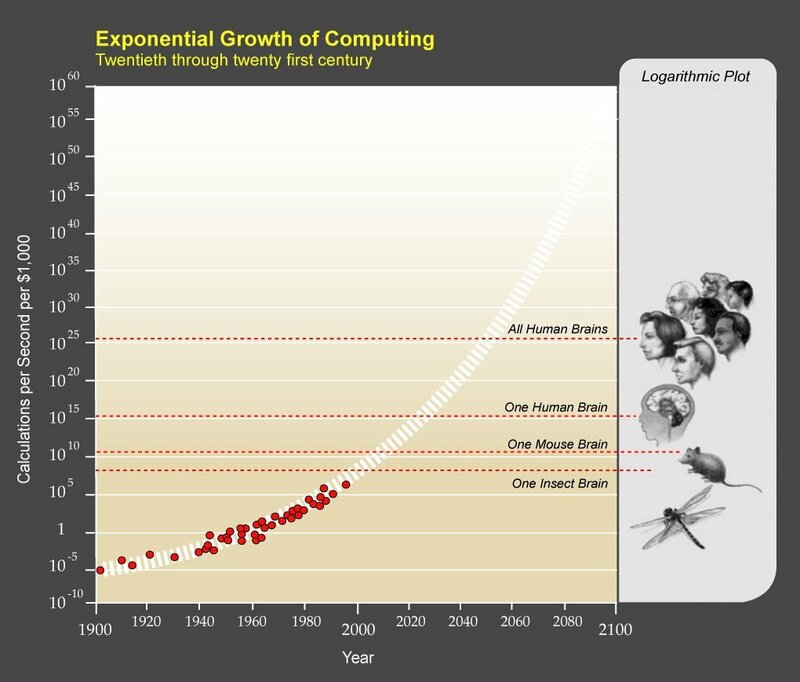 Around 2049 our processing power per chip will be the total capacity of all human life on the planet. Beyond that lays what Kurzweil has termed, the Singularity. The Singularity is a technological transcendence of the human race. A fundamental shift in the way we understand and interact with technology leading to an evolutionary leap of understanding and existence. Radically reshaping the way we connect with one another and the universe around us. In 2017 he predicted the Singularity would occur in 2045. While Kurzweil has his critics, to date he has been correct on 115/147 with another 12 that were “essentially correct” – off by a year or two. That’s 86% of his predictions which have become true. I’d never be mistaken for a proficient gambler, but those odds seem likely to occur. Progressive projects should recognize the impact of these discoveries on both the present and future to help create institutional alternatives that would maximize the tremendous potential technology will unlock within us.